Looking for a CAPABLE child’s bike that can log big miles? Want to try bicycle touring with your kiddo, or just need a great steed for commuting around town? The Islabikes Beinn 20 is an adult-quality bike in a pint-sized package, capable of tackling nearly any challenge you throw at it. 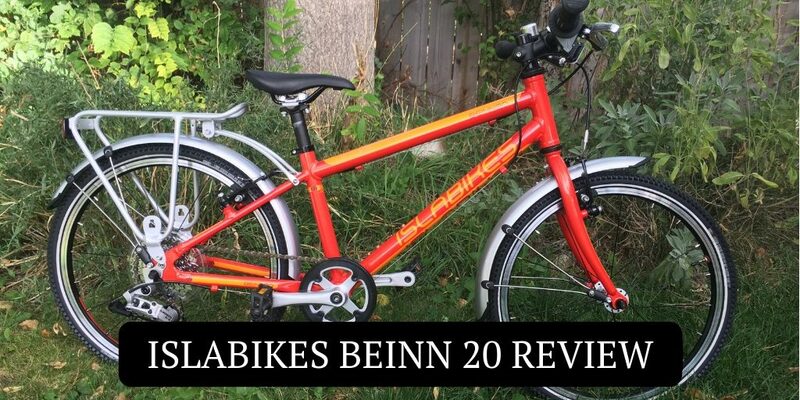 The Beinn 20 is a lightweight, durable, and high-quality kids bike for kids ages 5 and up. It comes in both a Small and Large version which allows it to fit a wide range of ages and body sizes. While capable for any kind of riding, it is particularly well suited for the commuter, touring, and cyclocross crowds. Islabikes offers more accessories and customizable options than nearly any other kids bike manufacturer. This is a huge draw for parents. In our Biking with Kids Facebook group, we’ve had several parents choose the Islabikes Beinn due solely to the ability to add a rear rack. It can hold 39 pounds and is the real deal. We’ve been using the rack to carry my son’s backpack, but plan to use it in the future for some real bike touring. Other optional add-on items include fenders (love ours! ), a kickstand, mountain bike tires, and a name decal! If you are buying the bike as a gift, the personalized name decal is a really cool touch. 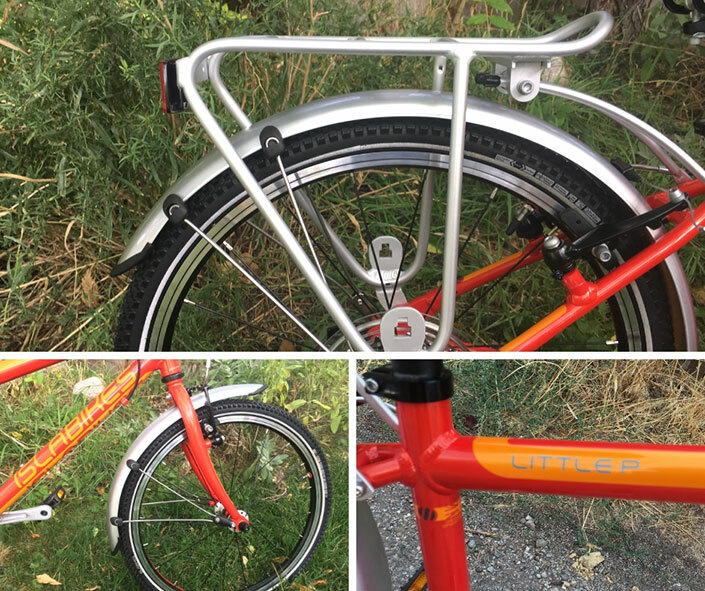 The other thing worth mentioning is that if you order the rack or fenders when you buy the bike, they will come installed which is awesome. Even compared to other high-end kids bike brands, like Woom, the Islabikes offerings have heart-burn inducing price tags. Keep in mind, however, that they also have exceptional resale values especially in cities with a high commuter population, like Seattle. 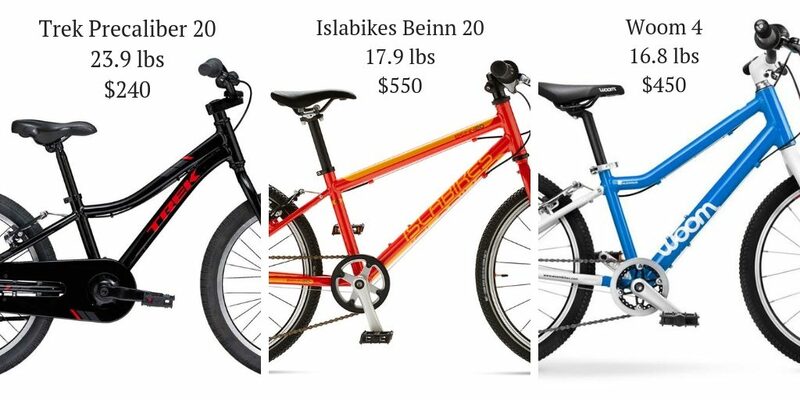 We’ve known parents that have recouped 70% of the purchase price when they’ve resold an Islabike. Islabikes has the brand-recognition and reputation for quality that make them a hot seller in the resale market. If you don’t want to go through the hassle of selling the bike yourself and you want to upgrade to the next size Islabikes, you can also consider the Islabikes buy-back program. They will “buy back” your current Islabikes for 1/3 of its purchase price and apply it toward the price of the next size Islabike. At under 18 pounds, the Islabikes Beinn 20 is exceptionally light. Compared to most kids bikes you can get at a local bike shop, the Beinn is significantly lighter and easier to handle. The Trek Precaliber 20, for instance, weighs a whopping 24 pounds. The only bike we know of that is lighter is the Woom 4 which comes in about a pound less. Thanks to its featherlight weight, we highly recommend the Islabikes Beinn 20 for all kids, but especially for smaller, more petite children and those with low muscle tone. For my own son, who consistently measures at the bottom of the BMI charts, I can almost instantly guess the weight of a bike by his attitude on the bike. The lighter the weight, the faster he goes, the happier he seems, and the further he can ride without complaining. On the Islabikes Beinn, he’s a happy camper. 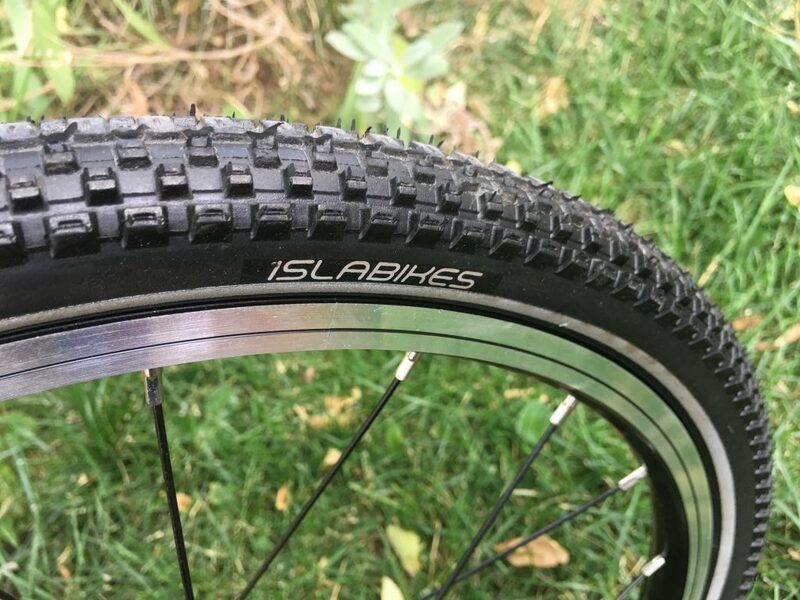 We really like the in-house tires that come standard on the Islabikes Beinn 20. These tires are perfect for biking to school, commuting, and even cyclocross. They are narrow enough (20×1.4) to be fast rolling but also have enough tread to handle gravel rail trails and muddy cyclocross courses. If you want the bike to be able to handle even more challenging off-road terrain, you can upgrade to Schwalbe Black Jack tires at checkout. Although this isn’t the bike we would choose for serious mountain biking, if you want to be able to use the bike as an all-around recreational bike, it is certainly capable of tackling mild singletrack. Chances are the Islabikes Beinn 20 will be your child’s first introduction to gears. Depending on how old they are and how comfortable they are on the bike already, this may be an easy transition or a harder one. Fortunately, the SRAM 3.0 grip shifter makes it as simple and physically easy as possible. Although there is plenty of debate about which is easier for young kids–grip shifters or trigger shifters–we’ve found that for most children, grip shifters are more intuitive. This makes them a great choice for a first bike with gears. 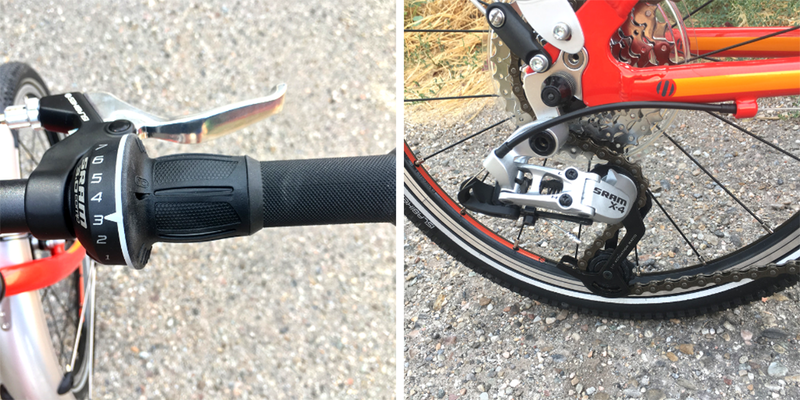 My son found that the SRAM 3.0 grip shifter was easier to operate than the Shimano Revo shifter on his Guardian 20 and had no problem shifting between gears thanks to the SRAM X4 derraileur. 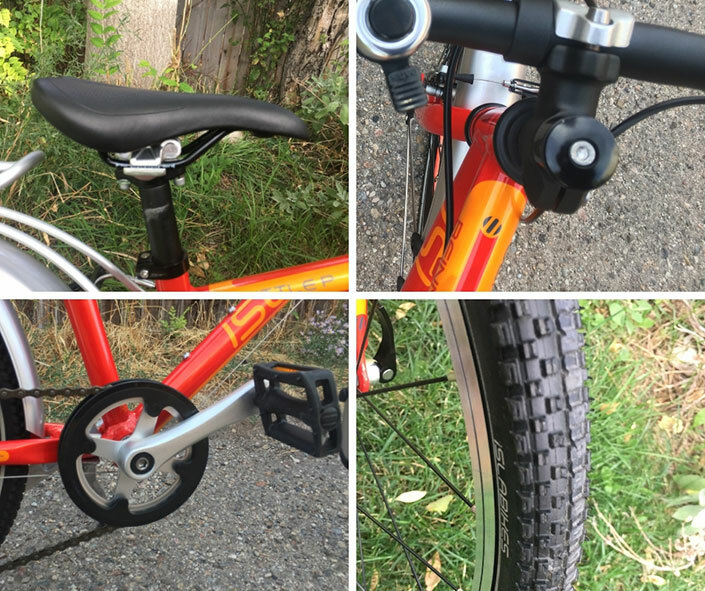 The wide range of gears is adequate for whatever type of terrain your child may be riding. One of the reasons that the Beinn 20 costs as much as it does (and why it holds up thru multiple children) is the quality of the components it is built with. Islabikes really hasn’t cut corners anywhere. They’ve created their own in-house line of components including lightweight wheels, appropriately-sized (127mm) aluminum cranks, ergonomic saddle, and ahead headset. Both the front and rear wheel have quick-releases, which we really appreciate and think all bikes should have. After all, who carries a wrench with them on a bike ride to fix a flat?! The saddle is comfortable but not overly padded or bulky. In fact, this is probably the nicest saddle we’ve seen on a kids bike thus far. Finally, the pedals are large enough to provide a good platform and have plastic pins to help create traction. The cranks are short and have a narrow Q-factor, meaning your child will be comfortable while efficiently transferring power to the bike. Like pretty much everything on the Beinn 20, the brakes are made in-house, and we’re happy to report that they’ve done an exceptional job designing them. The mico levers are easy for tiny hands to reach and pull, and the v-brakes themselves are powerful. In fact, I decided to take the bike for a spin around the block and down a few steep driveways. The brakes did a great job of stopping even my weight. 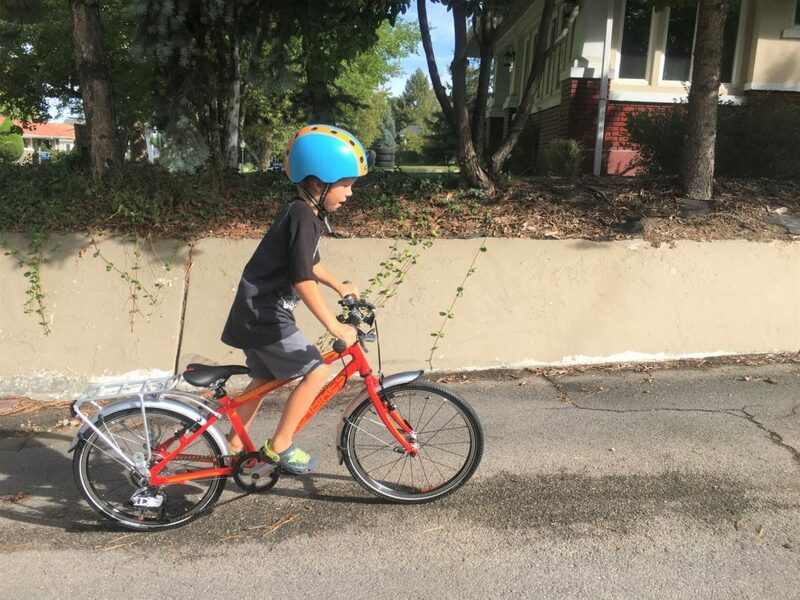 Islabikes is pretty much amazing in that they will go out of their way to help make sure you have the right size bike for your child. We chose the Islabikes Beinn 20 Large for my 6-year-old with a 21-inch inseam and who wears a 6T pant. He is pretty much at the bottom end of the size range for the large, but even with the seat lowered nearly all the way, he’s super comfortable on the bike. 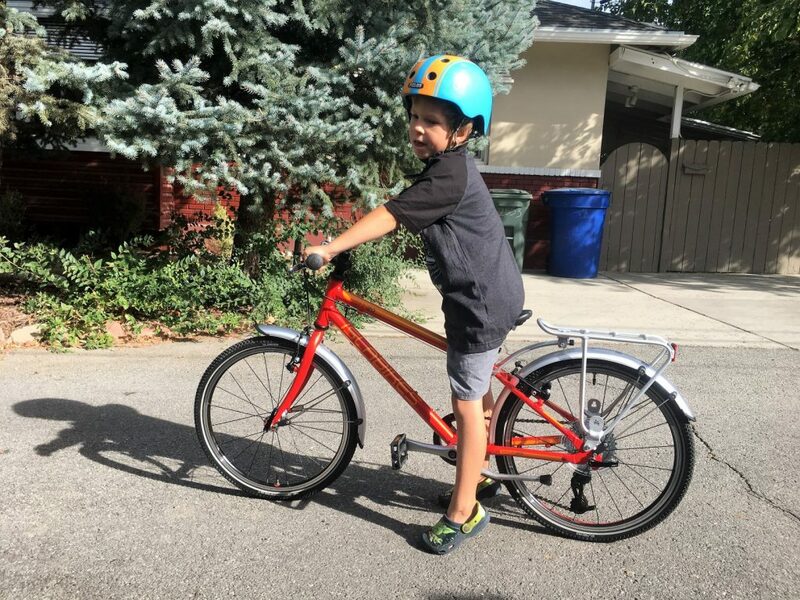 For smaller kids, the Beinn 20 Small accommodates a minimum inseam of 18.5 inches, making it one of the smallest 20″ bikes out there. The Beinn 20 comes with a spare tube. We really appreciate this because, really, who has a 20-inch presta valve tube laying around the house? The only thing we would have added to the bike is a quick-release seat post collar. Yes, this is easy and cheap to add but it would be nice if it came standard. Kids grow constantly and it’s a pain to have to search for an allen wrench each time the seat needs to be raised 1/4 of an inch. The Beinn 20 comes with a bell. We have struggled putting on a water bottle cage on other 20 inch bikes. Most either don’t accept a water bottle cage or else the frame is just poorly designed to accept a full-size water bottle. 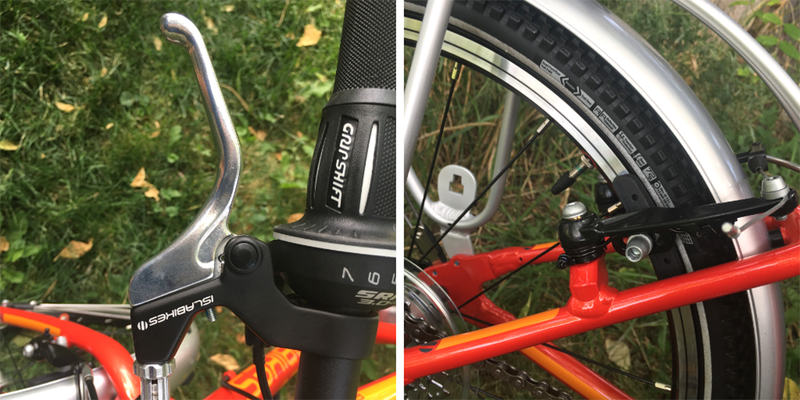 Therefore, we were happy and excited to find that the frame on the Islabikes Beinn 20 will accept both a water bottle cage and a full-size water bottle. Exciting stuff for thirsty kids! If you are looking for a high-end 20″ kids bike, there are really only a couple of bikes that can compete with the Islabikes Beinn. The Woom 4, Prevelo Alpha Three, and Early Rider Belter are probably the bikes closest competitors. The Islabikes Beinn 20 is a pint-sized package of perfection. It’s a do-it-all bike that will allow kids to live up to their potential and have fun doing it. The only downside is the price, but let’s be honest: in life, you get what you pay for. Perfection comes at a price.